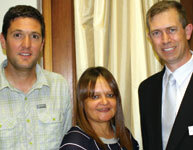 From left: Eugene Tondolo, SAFPA president; Melanie Malema, Sparrow FET College; Hugo van Niekerk, Festo. At a recent SAFPA technical evening, Melanie Malema from Sparrow FET College gave a thought-provoking talk on the future of the SETAs and the Government’s proposed education process for apprenticeship training and the implications this will have on currently accredited fluid power training courses. Thank you, you have successfully shared this article. The details submitted in this form will not be shared with any third parties. I recently had the privilege of attending the Hydac sales conference in Saarbrucken Germany – an eye opener in terms of a new directive in the fluid technology world.